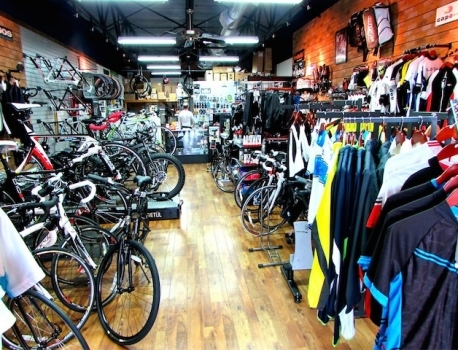 We pride ourselves in maintaining a clean, cutting edge bicycle shop. We also are lucky to have Jim Monks as the head of our staff. Jim, the head technician at The Bicycle Lab, brings over 38 years experience in just about every aspect of the cycling industry. The Bicycle Lab “breaks away” from the pack by helping you understand what is the best bike for you. The Bicycle Lab has the ability to custom order the right bike whether you are a newbie, or an avid cyclist looking for the right trends. We specialize in custom builds, but we can also set up our customers with the best stock bikes from the leading international dealers. The Bicycle Lab methodology starts with matching the customer with correct bicycle fittings using our experience, advanced certifications and cutting edge technology. The Bicycle Lab wouldn’t have it any other way. A free general fitting is included with any bicycle purchase. And for the highest level of customization, The Bicycle Lab provides top-tier add-on services using Retul Fit Technology. Retul is the ground breaking, most advanced bicycle fitting system on the market today. The Retul System reads the body in motion, in three dimension at high speeds. An observer can not match the accuracy of Retul’s ability to measure lateral, vertical and horizontal movement. The result is that the rider will have a true fit to his or her bike, maximizing efficiency and performance, while avoiding discomfort and injury.